The ranunculus is a flower that symbolizes charm and attractiveness. The flower is a perennial favorite for bridal bouquets and wedding design. Why not make some of these flowers from crepe paper? They are almost as delicate and lovely as their real counterparts, but will not wilt and die. The thrifty bride can make her floral decorations months ahead of time, saving herself cash, stress and time! Download the free paper flower template, print it on heavy card stock and cut the petal templates by hand with scissors. Using the paper templates as a guide, trace the petal templates onto the crepe paper with a pen, then cut twelve pink petals, twelve beige petals, eight light green petals and five dark green small sepals by hand with scissors. Stretch each petal gently with your fingers going against the grain of the crepe paper. Your petal should now have a "cup." Nothing in nature is straight and cupping the crepe paper petals will give the flower a realistic look. Gently stretch and cup the dark green sepals. Poke a hole halfway into the styrofoam ball with the floral wire. Remove the floral wire and apply a bit of hot glue onto the hole. Reinsert the floral wire into the styrofoam ball and wait a few minutes for the hot glue to dry. Cut a 4" x 4" square of light green crepe paper. Cup the middle of the crepe paper square and place onto the styrofoam ball. Wrap the light green crepe paper around the ball and fasten the ends around the floral wire with floral tape. You may have to trim the excess crepe paper with scissors from the floral wire to reduce the bulk, before wrapping the floral tape around the floral wire. Continue to cover the length of the floral wire with floral tape. Cut the floral wire stem with wire cutters to a 12-inch length. Run a line of hot glue onto the bottom of a light green petal. Attach the petal onto the styrofoam ball center. Press firmly into place with your fingers. The glue will be hot so take care not to burn your fingers. Continue gluing and placing the remaining cupped green petals clockwise onto the styrofoam ball. Continue to glue the beige petals clockwise around the flower head with hot glue. Continue to glue the pink petals over the beige petals. Bend and stretch the petals on the outer edges of the flower to add dimension and realism. Glue the sepals to the bottom of the crepe paper ranunculus head with hot glue. You can give the underside of the flower head a finished look, by glueing a one-inch dark green crepe paper circle with hot glue over the sepals. This step, however, is optional. Make a beautiful ranunculus flower arrangement for weddings, bridal showers, baby showers or other types of parties. You can also make an arrangement as a gift just to tell someone how special they are to you! You don't have to wait for a holiday or anniversary to give someone you love a floral gift! 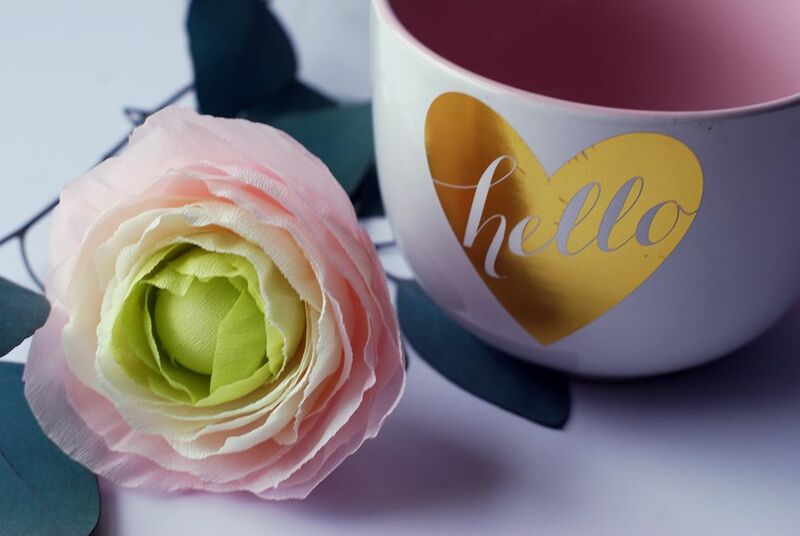 Crepe paper ranunculus flowers work especially well in table arrangements and bridal bouquets.Make sure to add other types of paper flowers to your arrangements or bouquets to help give your designs interest and added drama. Crepe paper sweet peas look especially lovely paired with the ranunculus! You can learn how to make a crepe paper sweet pea here. 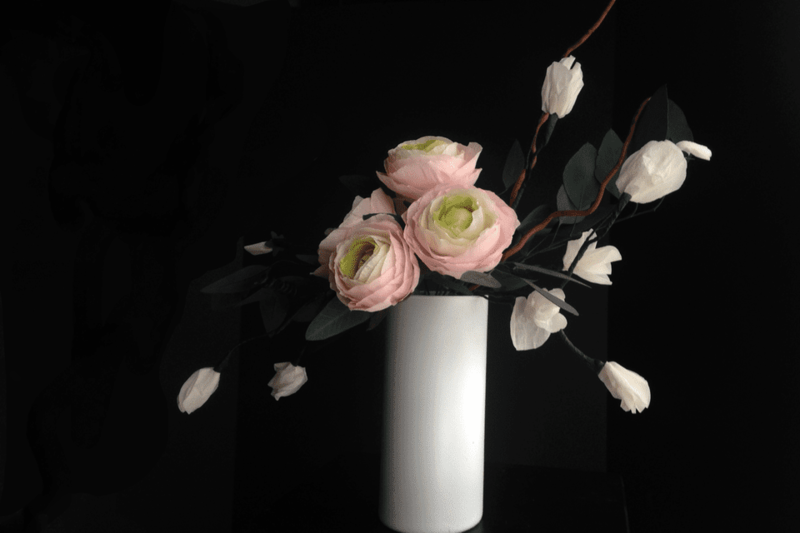 You might also want to add live or dried seeded eucalyptus leafs to add an element of realism to your design.You will discover that seeded eucalyptus looks simply stunning with these types of paper flowers! You can find live eucalyptus at most grocery store floral departments, and dried eucalyptus is available for sale at your local hobby supply store. These flowers are guaranteed to delight your friends and guests!